Traveling with Indian Moments, over the last six years has opened my heart and mind to the extraordinary and indescribable world that is India. They have become my dear and trusted friends and I am honored to partner with them. They shine with kindness and caring and are humble in their expertise and hospitality. Most of all they fully understand the heart of a photographer which is evident in the itinerary before you. Under their intuitive guidance, we will weave our way through visual centuries of India and learn to focus on the images that matter most. I have spent my life working as a fashion photographer for the best magazines in the world for which I have traveled from one corner to the next. But I can truly say there is no place that has found it’s way into my soul like India. I promise that you will never want to put your camera down and will regret it if you do. I cannot explain the magic that India holds over everyone who opens their eyes to it’s immeasurable beauty but I promise that beauty exists in every corner and every face you will meet. More than that, I hope to fine-tune your ability to detect a great shot in the midst of a swirling cornucopia of visual magic that can opentimes be overwhelming. Instead we will make it easy. Welcome to amazing India! 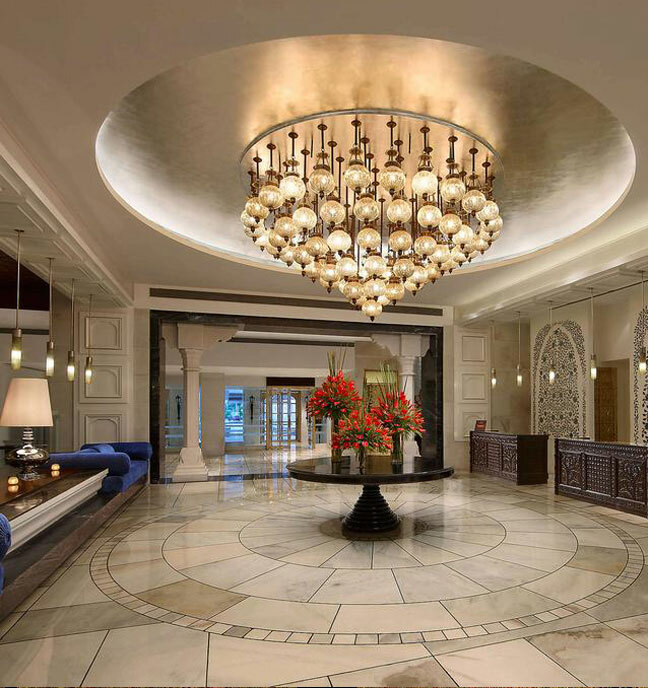 Upon your arrival in the Delhi airport and transfer to your hotel by the airport representative. The day today is perfect for you to relax and prepare for the exotic journey from tomorrow. A spectacle worth a million shots! You will be transferred by morning train journey to our luxury tented camp in Pushkar where I will wait for your arrival. 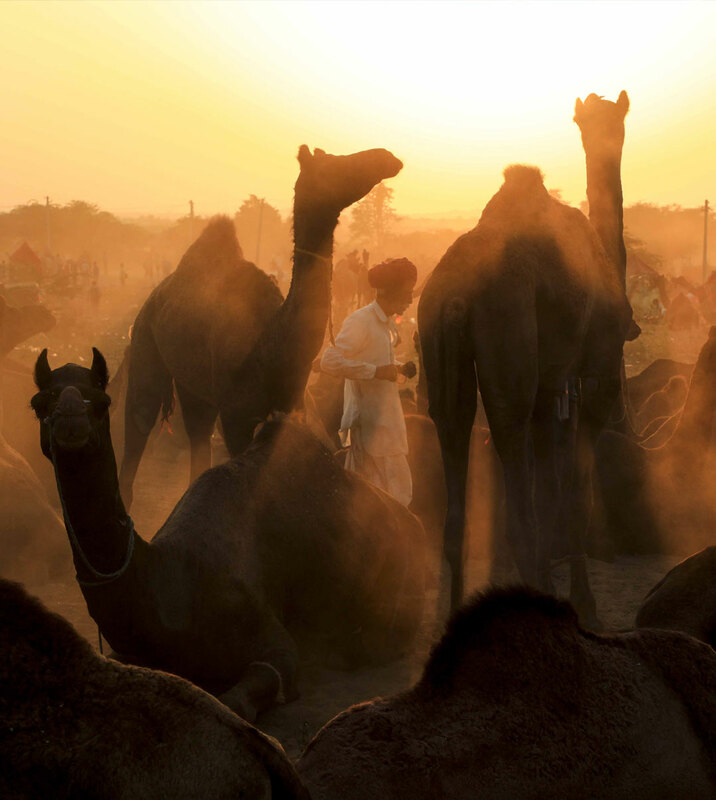 I am excited to welcome you not only to India but to the famous Pushkar Horse and Camel Fair. Pushkar has been the inspiration for three photographic books I am currently working on. It is rich in photographic opportunities that will convey both the historical and cultural essence of India. I have been five times and I never seem to take the same photograph twice. Everywhere your eyes turn you will find a sea of tents sailing under the vast desert sky. Here they house their horses proudly displaying banners of all colors imaginable. Not only will you have the opportunity to photograph herds of camels walking towards you or racing horses kicking up dust as they fly through the desert sand but you will find countless opportunities to take beautiful portraits. Turbans and shawls of every color and design are the standard garb while welcoming smiles invite you in. On this day we will take the morning train which will reach Agra by early noon. In Agra I will join everybody else and let the expert local guide do all the talking about the immense Mughal monuments. We will have lot of fun having ourselves in the frames of the finest old buildings like the Tajmahal. 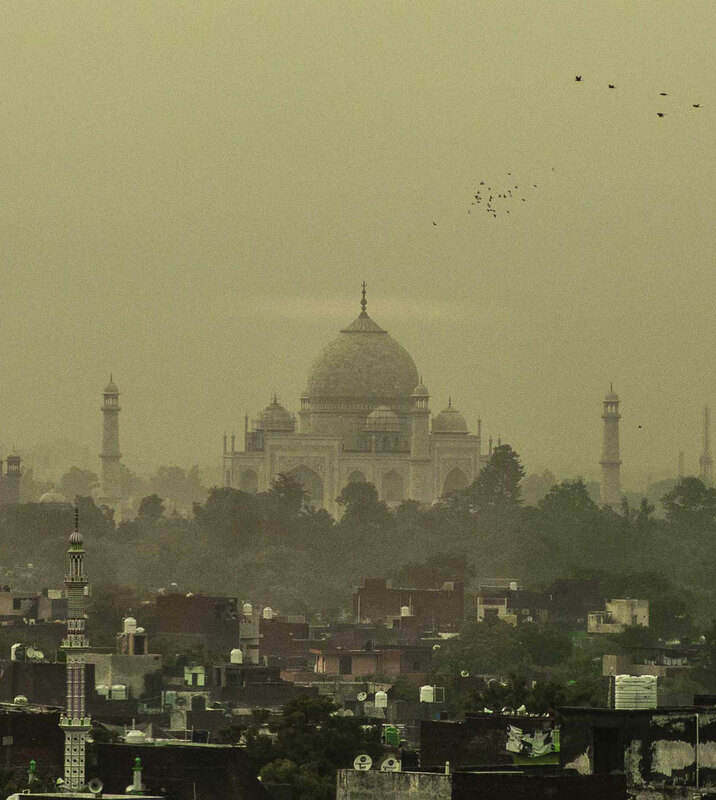 We will be visiting the Taj in early morning light the next day. 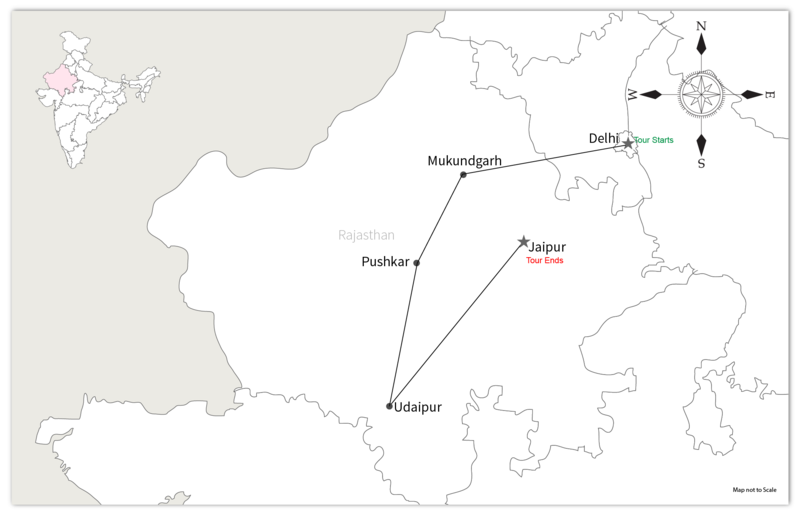 Our drive to Jaipur will have three very beautiful stops. The first one will be the Fatehpur Sikri ruins which is a huge abandoned city made entirely in one colour which is the Red Sandstone. The second stop will be the stepwell of Abhaneri which is a marvellous specimen of ancient water conservation technique of India. The deep well has countless series of small little steps in perfectly symmetrical fashion leading all the way down to the water level. The locale is very beautiful and we might be lucky if there is a group of colourfully attired Rajasthani ladies somewhere in the scene. Our third stop before Jaipur will be the beautiful Naila village. The village is the source of many textile wonders which Jaipur is famous for. The villagers here are involved in various embroidery arts and silver brocade works. The most amazing work is the ‘Aari Taari’ which is a painstaking needle work of inserting silver threads in fine fabrics, the resultant effect is the perfectly glittering sheer fabric. Even in our next two days in Jaipur, we will take out some time to visit the Sanganer Town. Sanganer is the leading center in the world for the block printed textiles. The block print work is responsible for making many textile brands of Jaipur very famous in the world. We will also visit the Anokhi textile Museum in Amber. Needless to mention, our textile trip in Jaipur will be felt complete only after we spend loads of our time in the famous bazaars of Jaipur. Jaipur is a city I have truly come to love. 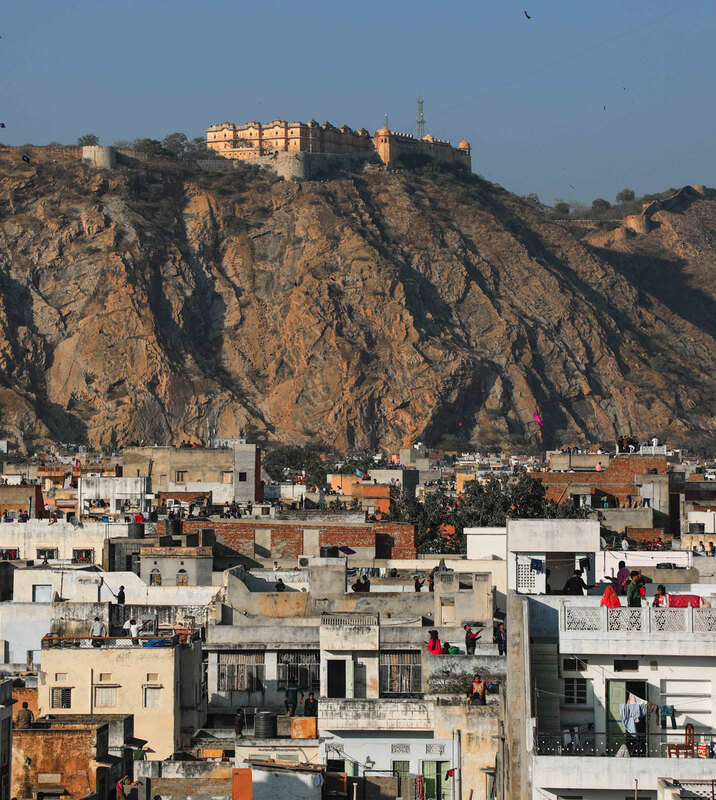 Jaipur is incredibly friendly, bustling, busy, and always inviting. 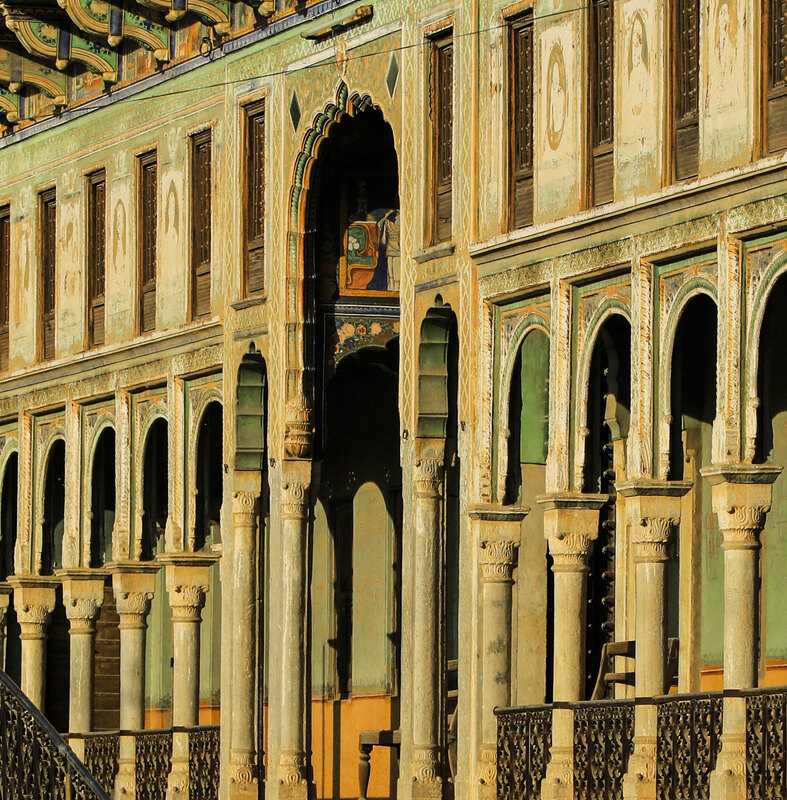 Within the wall that surrounds the heart of this old city exists a honeycomb of countless shops and bazaars chock full of everything from handicrafts to flowers to spices to bangles and bracelets and everything in between. It is a cornucopia of delight for shopping and photography. One could easily spend the entire day on one street and never tire of this visual feast. The markets are open every day and just a quick tuk tuk ride from our hotel. In our drive today we will clearly know that we are entering Shekhawati as we pass through towns bustling with street bazaars and facades of old houses with colourful frescoes on lime plastered walls.These old houses with magnificent entrances and doorways and delicate looking balconies are known as havelis, the traditional mansions of India. 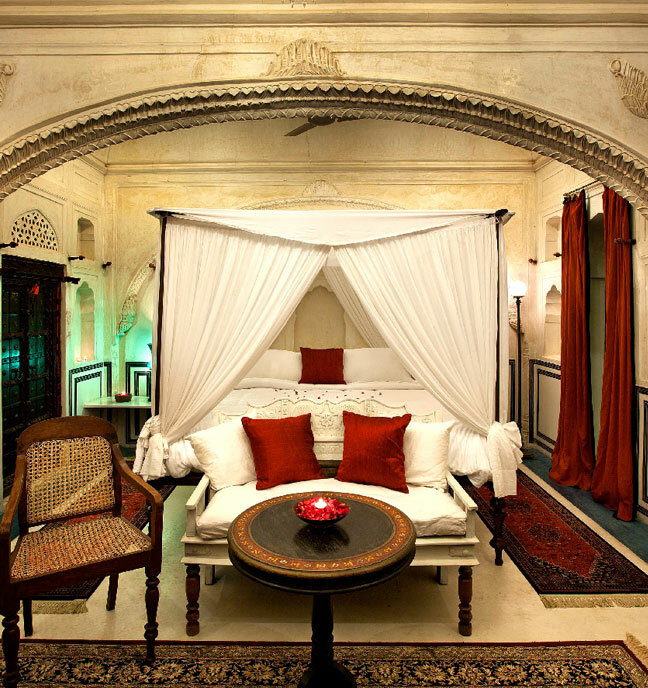 We will be staying at one such restored haveli, Mukund Haveli, my favorite place in India. We will travel by car to enjoy a charming town with both photographic and shopping delights. 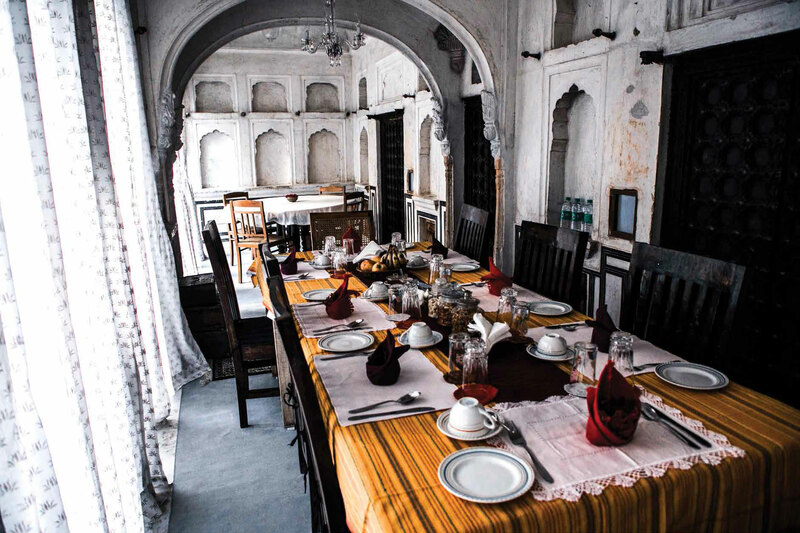 Magic awaits our return to the haveli and a gourmet meal in a spectacular setting. In our other days here we will have time to catch the local fabric dyers at work early in the village, see more of Shekhawati to photograph some of the most beautiful frescoes and even visit a beautiful stud farm. There will be a Yoga and even cooking lesson at the haveli and I will enjoy photographing all of you! Cocktails and hor’doerves in the garden and dinner by candlelight in the courtyard. To capture a life unthinkable anywhere else. Dev Deepavali illuminations. We will drive to Jaipur airport to fly to Varanasi. Saving the best for last. I first visited Varanasi on my second trip to India. It was all that I imagined India to be. Mystical, magical, mesmerizing. A photographer’s dream of the vibrant, exotic and enchanting. For me there is little that compares to the ethereal vision of pilgrims bathing in the Ganges as the sun rises over the river. But visiting Varanasi during Dev Diwali compounds the excitement one hundred fold. 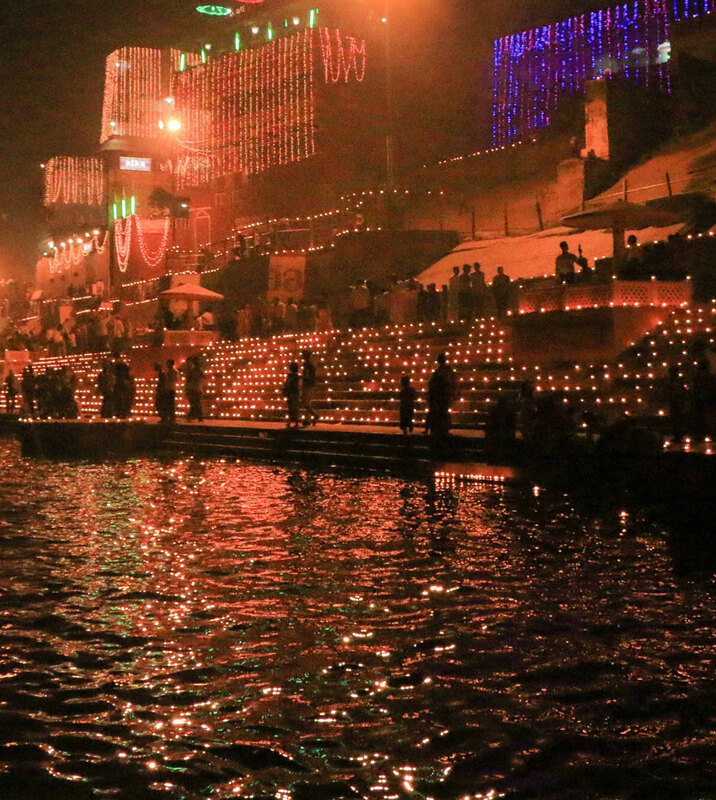 Dev Diwali in Varanasi is the most magical experience I have ever known. Pilgrims arrive by the thousands to celebrate under the full moon. The city becomes a festival of lights as the entire river bank is bathed in candlelight. Hundreds of boats gather amidst floating candles on the water while music and fireworks fill the sky. After our last day in Varanasi we will be flying back to Delhi (November 26. 2019) for our journey’s end. Once again, the days in India have gone by too quickly. It will be sad to say goodbye but it is my hope that as you head home on this day, your lives will have been enriched by what we have felt, shared and photographed together. Our photo group will comprise 8 participants. The hotels in India, especially those in this tour, are truly fabulous places to stay and it works well to share the room. There is also an option of having exclusive room by paying a supplement. Our drives will be done through a very roomy air-conditioned vehicle and having a full time Indian Moments professional will help enriching the experience.